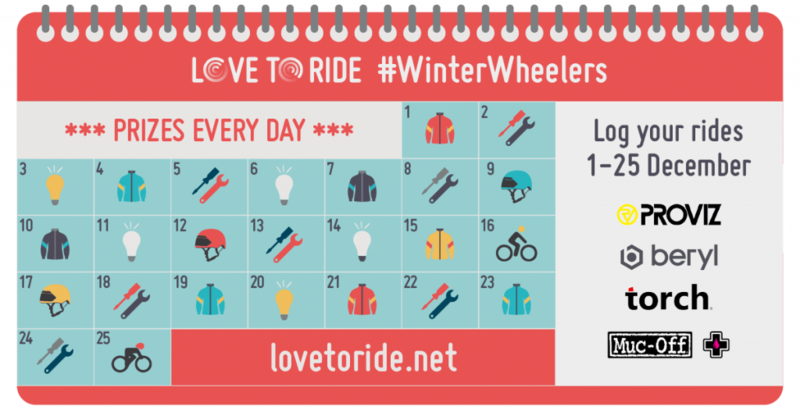 Join Love to Ride’s Winter Wheeler’s campaign and be rewarding for cycling this December! As a university we’re competing against other organisations in Brighton and Hove to see who can get the most people on bikes! So log your rides to help us climb the leader board and be in with a chance of winning some amazing prizes too – including bike shop vouchers, hi-vis gear, bike lights, helmets and even a holiday! Register with Love to Ride, if you haven’t already! Get cycling and log any 10 minute plus cycle ride on the online dashboard on your profile – you can also add photo, goals, invite friends to ride and see your earned badges! If you have a smart phone or tablet, automatically log your rides by connecting with the following apps: Ride Report, Love to Ride, Endomondo, MapMyFitness or Strava. Ride anytime, anywhere from 1-25 December and log every ride here or connect an app to go in the daily prize draw. From 1-25 December win wet weather gear from Proviz, laserlight and burner sets from beryl, maintenance kits from Muc-off, T2 helmets from Torch PLUS two local bike shop vouchers! We’ll also be encouraging you to get on your bike at our info stall on Thursday 6 December, 10.00 – 12.00 in the Cockcroft foyer. Pop along to find out more about Winter Wheelers & pick up a cycle freebie! All aboard the bike train! If you want to build your confidence, get to know the inter-site routes better or just fancy a ride… come and join us! 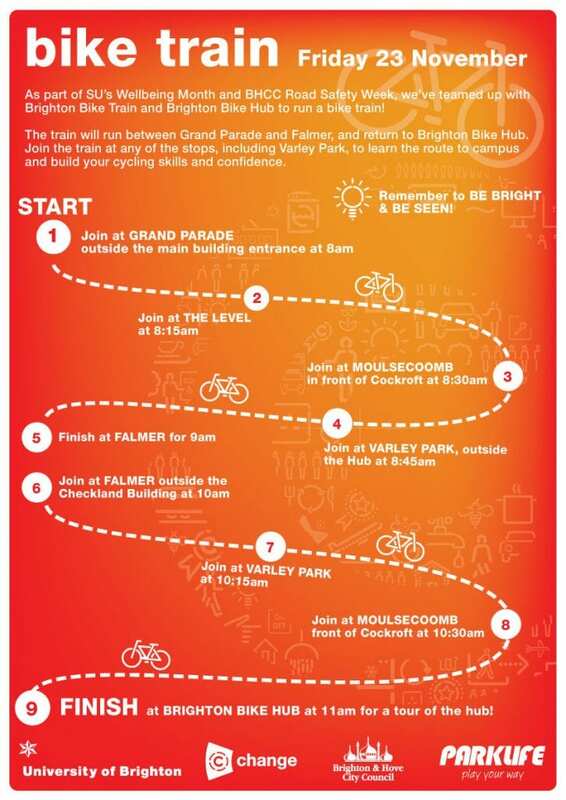 Friday, 23rd Nov, starting at 8am at Grand Parade… join/leave at any of the stops along the way. The bike train will be led by Brighton Bike Train, part of the Brighton Bike Hub where the train will finish! Come & join us at the hub to learn how to maintain your bike. This event is being held as part of Share the Roads, Brighton & Hove #RoadSafetyWeek & Brighton Students’ Union Wellbeing Month – Active Week. This event is being supported by the Brighton Bike Hub, a community cycle workshop in Brighton which is supported by the university. Each year the university donates abandoned bikes from its sites for refurbishment and works with the hub to run events and activities for students and staff, both on campus and at the hub. Welcome to the University of Brighton! Welcome to all students starting at the University of Brighton over the next few weeks! If you’re living in halls of residence, drop by and see the c-change representatives at your move in day event and find out about the halls recycling competition and your travel options to uni. We’ll also be at the Freshers Fairs so drop by and say hi and let us know what activities you’d like to get involved in this year as part of the c-change campaign. 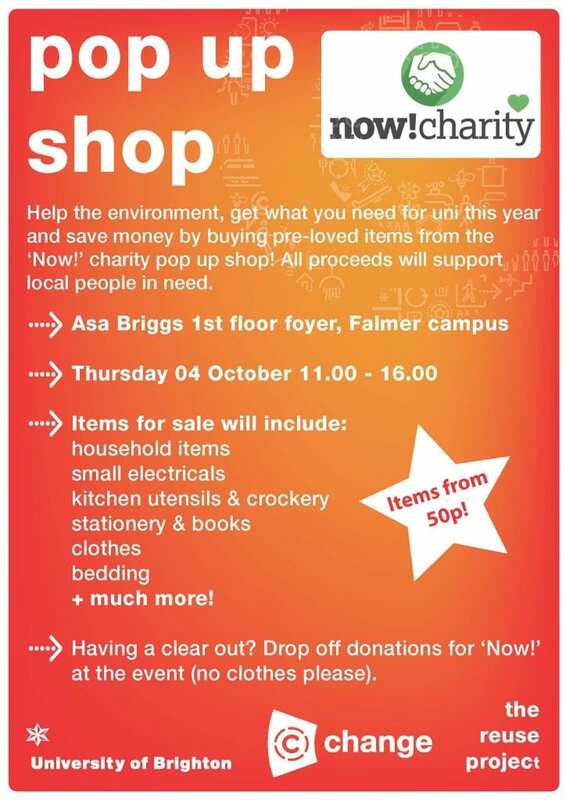 We’ll also be holding a Pop Up Charity Shop at Falmer on 04 October, come & get kitted out for a bargain!